It’s a dirty job, but somebody’s gotta do it. And if you’re cooking, that would be you. But it doesn’t have to be the chore you dread. 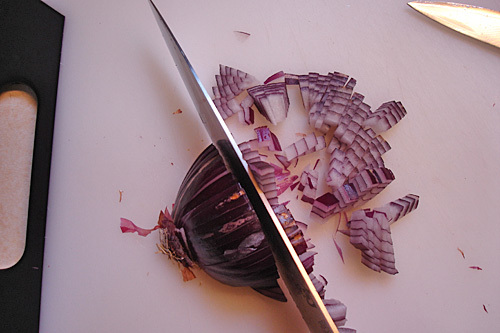 Here’s a pictorial on how to slice an onion. Produce is expensive enough — don’t pay extra for those nicities. Preparing onions isn’t rocket science. Once you know a few secrets, you won’t think twice about handling onions yourself. Okay, let’s cut to the chase and learn how to slice an onion. Click the photos to see larger versions. 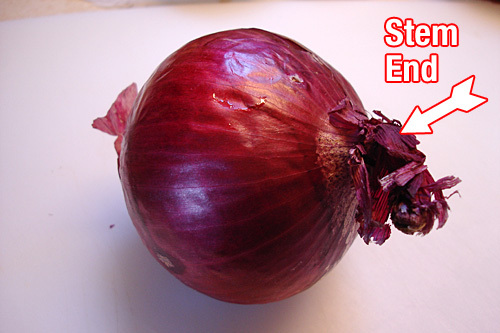 First, identify the root and stem ends of your onion. The root end is going to serve a useful purpose during the slicing process. 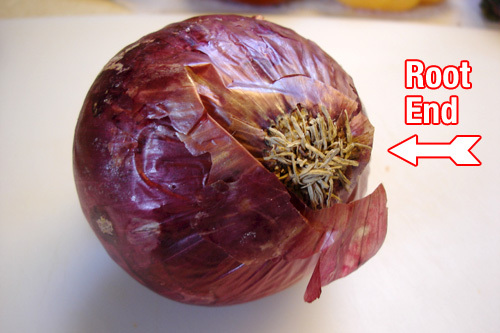 The root end of an onion has little stringy roots hanging from it. 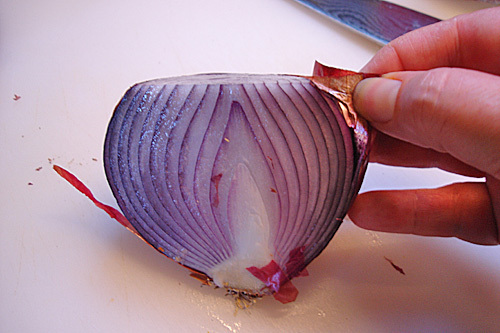 Using a sharp chef’s knife, slice the onion in half lengthwise; that is, from root end to stem end. The first slice, clean through the root end. 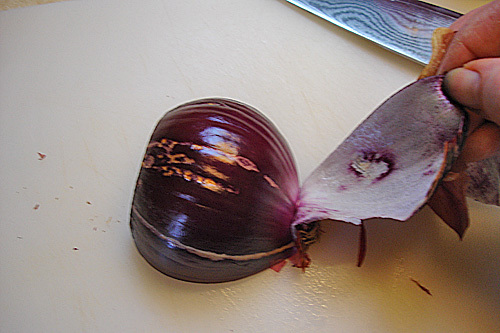 Note in the photo above that the layers of each half of the onion are held together at the root end. This is going to keep the onion from falling apart as go we along. Now, remove the stem end from both halves and discard. Now, for the peelin’. Lift the skin from the cut corner of the sliced end. Your thumbnail will easily get it started. Continue peeling back the skin, which should come off in one or two large sheets. If an actual layer of onion comes with it, that’s okay. Such a loose layer is on its way to drying out and should be removed anyway. In the photo below, a layer did come off with the skin. No worries — there are plenty of layers left. It’s hard to tell from the camera angle, but the skin came off in one sheet. No fuss, no muss. Start at one corner of the onion and lift the skin. Continue to gently pull the skin from the onion half. You’re ready to start slicing and dicing. If you simply need half moon slices (see photo below), you’re good to go. Grab your chef’s knife and hop to it, slicing down to the root end. If you need dices, no problem. I’ll show you the trick for getting perfectly sized dices with minimal knife work. We’re going take advantage of an onion’s thick layered structure and apply some geometry to create quick cubes (don’t worry; no long division required). Break out your favorite paring knife. 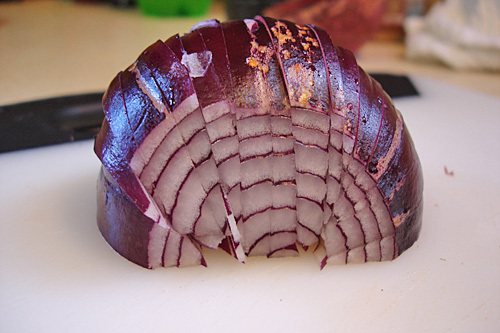 Onions have lovely thick layers. We'll take advantage of that fact to quickly dice the onion. 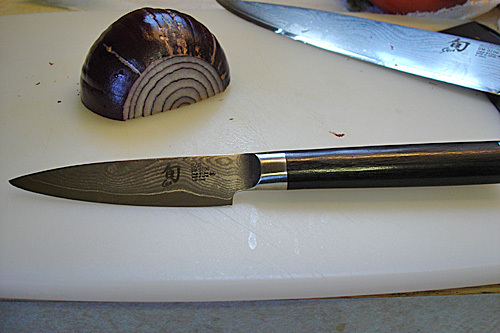 A paring knife will make easy work of the next step. In the photo above, notice how the layers curve downward from the center. 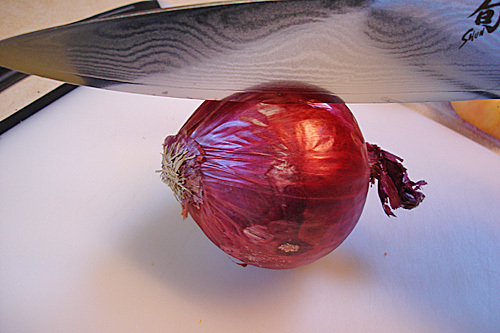 Place the point of the knife just in front of the root end, lengthwise down the onion and centered on top. You don’t want to cut through the root end — it will hold together the onion slices we’re about to make so that the final step is easier. Slice down through the onion. Place the point of the knife about 1/4" to the right of the first slice, tilting the knife slightly so the angle of the blade is perpendicular to the edge of the layers. 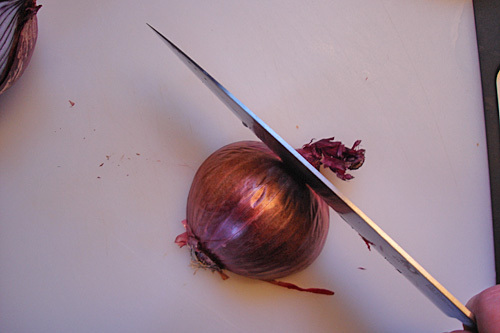 The first photo below shows the 5th cut into the onion — note the angle of the knife, and the little rectangles that have been formed by the previous cuts. 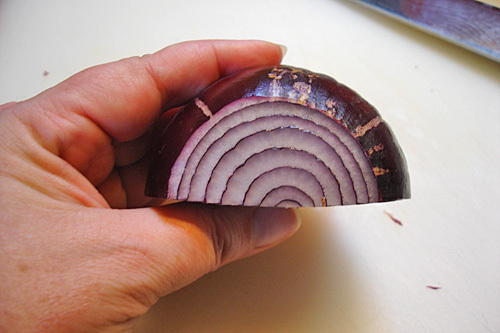 Continue slicing the onion’s right side, then slice the left side in the same manner. The vertical slices we've made have created the 3rd and 4th side (of 6) of the dices. Since we did not slice through the root end, the layers are still held in place, ready for the final series of slices. Grab your chef’s knife again. Slice the onion perpendicular to the slices you just made, across the onion. Continue slicing down to (but not including) the root end. We're almost done. 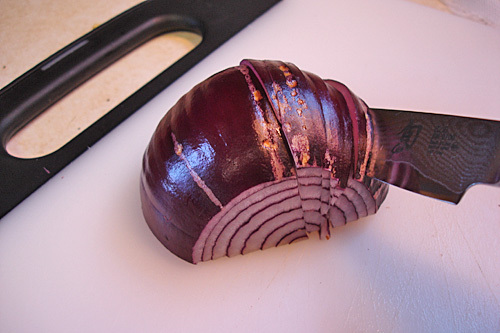 Now slice the onion perpendicular to the slices you just made. Look at those beautiful dices! Repeat with the other half. Dices are perfectly sized for almost all of your sauteeing tasks. If you need minced onions — minced onions are smaller than diced — chop through the mound of dices several times, using the rocking motion of your chef’s knife. An entire onion, and you’ve barely gotten your hands dirty. 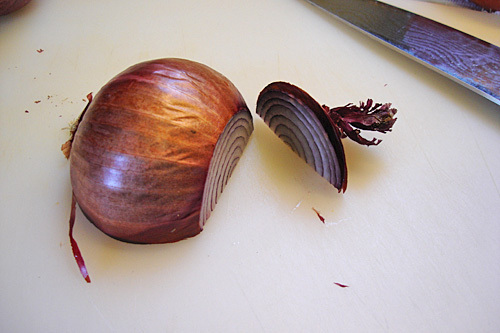 An additional benefit: since the onion layers are held together until the very last series of slices, you have much less eye tearing, because the juice is contained by the outer layer. Brilliant! That is the same method my chef friend taught me except she does not cut off the root end and, instead, pulls the skin down to the root and uses it as a handle while cutting. Very cool tip – I love it! I know this is months after the fact, but I have to drool over your knives. Shun knives! Maybe, someday, I will have knives as awesome as those. When I opened the box, a sunbeam shone down from above and angelic voices sung “AHHHHHHHH” in the background. 🙂 These knives are things of beauty … but devilishly sharp. I really had to firm up my knife skills. A slip with my other knives would cut the skin, but these things will easy remove appendages. Still, they’re awesome…. 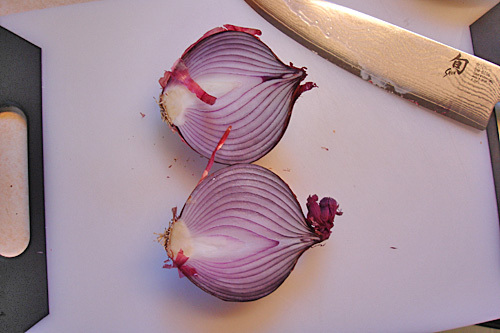 I always wondered what the difference is between slicing an onion lengthwise (from stem to root) or across. They both give you nice “arches”, but, Is there a difference? When do you use one vs the other? 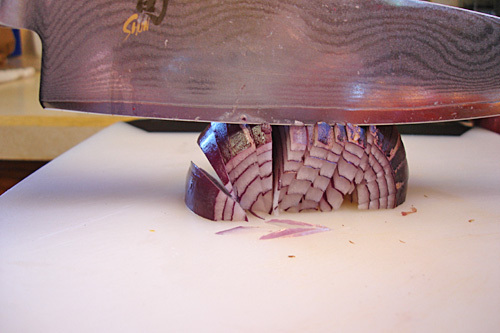 The lengthwise cut has two advantages for cubing and producing half-moon slices: a flat side to stabilize the onion during the slicing, and an intact root end that holds all of the layers together. But there’s nothing saying that you can’t do the cross-wise cuts (producing full, round slices), and then chop through the pile of slices with your chef’s knife to accomplish the same thing.